FORT LAUDERDALE, Fla. — The Islanders need to pull themselves together after a hugely disappointing Game 4, and they’ll have to try to wrestle this first-round series back from the Panthers on Friday night without Ryan Pulock. 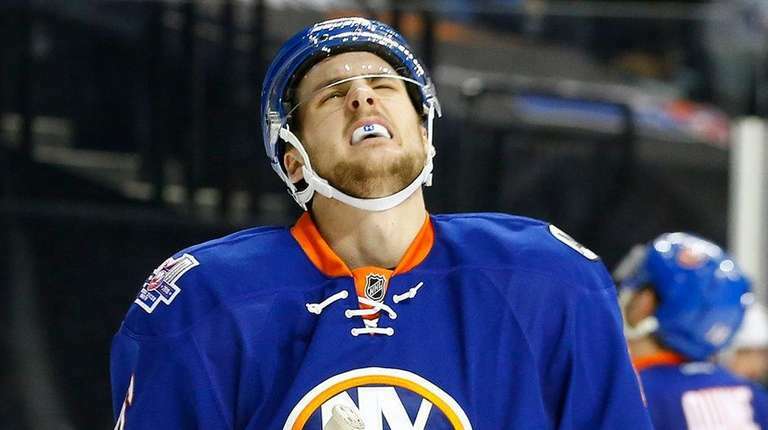 The promising rookie defenseman, who had three points in the past two games, did not travel to Florida with the Islanders for Game 5 and likely is done for the series with an upper-body injury suffered in the third period on Wednesday night. Even if the Islanders were fully healthy, Capuano had plenty to wrestle with heading into Game 5 in a series that’s even at 2-2 but feels as if the Islanders have fallen behind. They were coming off the high of Thomas Hickey’s Game 3 overtime winner and had a chance to seize the advantage in the series Wednesday night before their own crowd at Barclays Center. Instead, the Isles came out inexplicably flat and listless, muddling through a scoreless first period before dropping a 2-1 decision on Alex Petrovic’s goal midway through the third — scored with an injured Pulock on the ice, having just been hit hard and cleanly by the Panthers’ Garrett Wilson. Capuano spoke to Newsday as he prepared for a team meeting in which some unpleasant video would be shown. Capuano singled out three of his forwards three weeks ago and challenged his team to step up and grab its opportunity to make the playoffs. The team responded with back-to-back wins. Capuano wasn’t interested in naming names Thursday, other than to say the Islanders’ leaders have the chance to do the challenging in advance of Game 5. Capuano said he hasn’t decided who will play in Pulock’s spot. Adam Pelech, another rookie, could make his playoff debut, but the lefthanded Pelech would have to play his off side. Righty Marek Zidlicky or Brian Strait, a lefty who has played the right side often this season, are other options. The coach did not discount making a change at forward. Steve Bernier and Eric Boulton are the spare forwards and neither likely would alter the series, but Capuano also knows he can’t be much more patient with the nine forwards outside of the Nielsen-Tavares-Okposo line who have totaled three goals in four games. The Islanders haven’t won a Game 5 in a playoff series since 1987, an 11-loss stretch of futility.